Your best value! 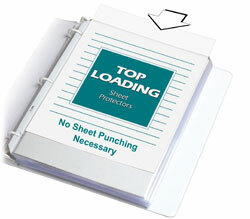 These traditional sheet protectors won't crack or tear, keeping your documents looking their best in three-ring binders. Acid-free protection means no photocopy transfer. Standard weight. Folded sheet protector is open on three sides. Includes black mounting paper to provide a professional look. 11 x 8 1/2. Clear finish. 50/BX. Suggested Use: Traditional sheet protectors won't crack or tear and with the black mounting paper, it keeps your presentation looking its best.